Who says you have to go to an amusement park to have a heart-pounding experience (in a safely controlled environment)? For the thrill seekers and young at heart, that urge to ride a roller coaster, splash down a log flume, or take a spin on a thrill ride never leaves, no matter what the season. If you're visiting a brand new city and taking in all of the sites each has to offer, there are plenty of opportunities to go full-throttle with amusement park-like attractions without ever having to set foot inside a park. Here are some of our picks for fun attractions that have an amusement park ride feel to them. This thrilling Chicago attraction offers an exhilarating tilt… err… twist on viewing the city skyline. Located nearly 1,000 feet above Chicago's "Magnificent Mile" – an area of the Windy City brimming with fine dining, shopping, and entertainment -- visitors have the opportunity to get a panoramic view of Chicago at an angle. Located at 360 Chicago, TILT is the world's very first observation deck that actually allows tourists to "tilt" forward and look down and out at the city. The attraction can safely accommodate eight people at a time. 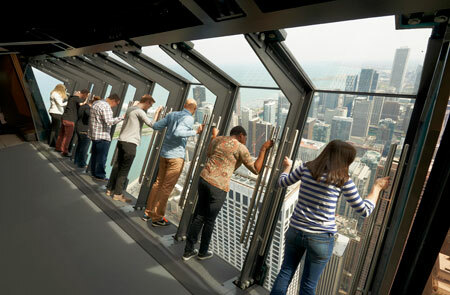 As they press themselves against the glass observation pane, visitors grip the side rails, while the TILT mechanism safely pushes the panes outward and grants them a unique perspective of looking waaaaaay down on the city from a totally unique angle. If you've seen the film The Last Vegas with Michael Douglas and Robert DeNiro, you probably remember the scene where two of the film's characters get their kicks on an unusual thrill ride. This ride, the X-Scream, could best be described as a massive teeter-totter hovering several hundred stories in the air. However, the ride featured in the film was no mere trick of the camera or something concocted by Hollywood. 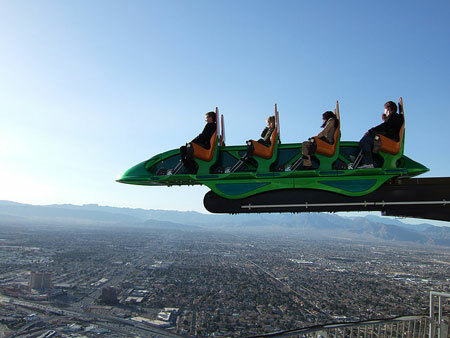 Rather, the X-Scream attraction is perched atop the Stratosphere hotel in Las Vegas and gives visitors a glimpse of Sin City from over 800 feet in the air. The ride is firmly anchored to the roof of the hotel and "shoots out" over 27 feet from the roof, dangling harnessed riders over the ledge and allowing them to peer out. What a rush! Get in touch with your inner Wallenda and take a stroll across Toronto's CN Tower… In the open air! The CN Tower is the sixth tallest standing structure in the world, standing over 1,800 feet high. The CN Tower itself features an observation deck that allows patrons to drink in Toronto from high in the air. However, the EdgeWalk feature lets tourists walk around the circular roof of the main hub's gigantic structure, situated directly outside the walls of the building's observation deck. Adventurous tourists are harnessed to a metal railing that secures them from falling nearly 1,200 feet below. These brave visiting souls are able to walk, hands free, around the circumference of the building. For safety reasons, the attraction is closed during the winter months, as well as during storms and periods of high winds. 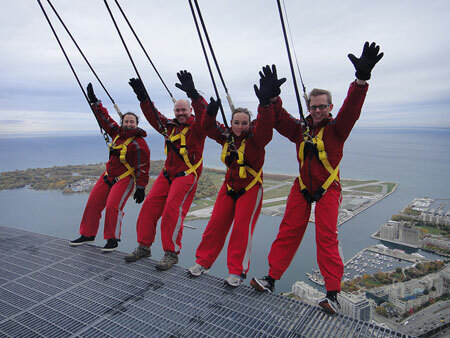 However, when EdgeWalk is open to Toronto tourists, it provides a thrill unlike any other! Philadelphia may soon have a 615-foot amusement tower atop a proposed casino and entertainment center. Developers proposed a casino with a structure that resembles Seattle's famed Space Needle. If it's approved and the bid for the casino project accepted, the attraction would be built by U.S. Thrill Rides and feature a winding track that takes visitors from the base of the needle (which may be as tall as 1,000 feet high) to the very top. At the pinnacle of the structure, visitors can peer out from one of two glass observation decks and have a 360-degree view of the city. The view from the top will also include shopping and fine dining. Here's hoping the City of Brotherly Love gets a thrilling attraction of its very own!